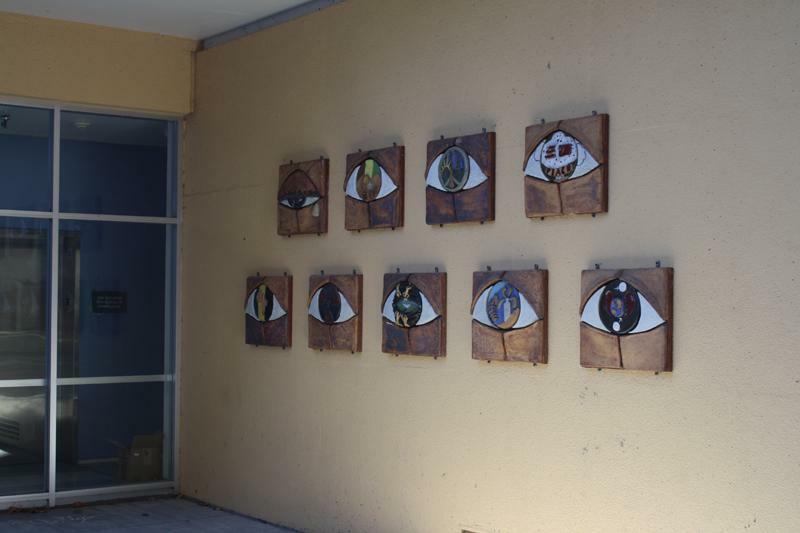 In late September, students and staff members observed that numerous mosaic eyes had been mounted on an exterior wall on the top floor of Palmer Hall. The two rows of eyes have each been painted with some sort of message pertaining to global issues. Symbols inside the irises the irises there are symbols calling for racial and gender equality, as well as world peace. “I came to work one day and the bottom row was there. Then I came to school on another day and the top row was there,” chemistry teacher Leslie Hart said. She was mystified as to where they might have come from. According to Joyce Porter, former president of the Tam High Foundation board, “[The mosaics] were done by the Ceramics Club in the 80’s…. I was in the upstairs storage room with [ the Principal’s secretary] Mary O’Leary, in Wood Hall last year, looking for something else and spotted these mosaic tiles in the corner and dragged them out to look at them.” Porter explained that she worked with the Tam administration to calculate details regarding height and safety. “Once I got the approvals, I hired Tam parent Steven Bouchard to hang them. The Tam High Foundation was in support of this project and paid for all costs, which were minimal,” she said.